DAY 2: What was your first deck and why/how did you get it? 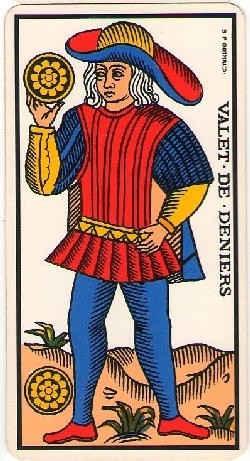 The first deck that I bought was back in the 1980s and it was a Marseilles Tarot. I bought it, not because I was drawn to the artwork, but because it was the only Tarot deck that I could find in Glasgow. Why did I get it? I can’t remember what spurred me into buying it….probably a desire to be Solitaire in Live and Let Die …… or maybe an episode of Tales of the Unexpected? I do remember that I was pretty desperate to get my paws on a set! However, I wasn’t enamoured of the blocky, naive artwork of the Marseillesl, but hell, you have to just take things as you find them, right? I do remember feeling very wicked when I bought them – as if I’d just bought something very illicit! I trundled back home on the train, walked the mile home and then sneaked the cards up into my bedroom. Like most folks, I started doing readings for myself as soon as I could get the cardboard packet open! Of course, the LWB was a very necessary part of the equation – I had not a clue what any of the cards meant! A couple of weeks later I found myself back in the bookshop and procuring Alfred Douglas’s book, The Tarot to help flesh out my readings.